In high school, I put off getting my driver’s license so I had to find other ways to get around. Public transportation and biking made me feel independent and like I had more ownership of my city. That feeling has continued to grow as I’ve lived in other places. I’m excited by Alta’s mission to increase access safe, fun, and healthy transportation options for everyone. Miranda recently completed coursework in planning at UC Berkeley and is excited to bring her new knowledge to her position as Marketing Coordinator. 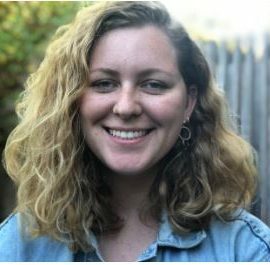 Prior to joining Alta, she served as an AmeriCorps member with a college access non-profit in Saint Paul, Minnesota where she worked closely with high school students on their journey to college. She is passionate about alternative transportation and design and its intersections with social justice and public health.